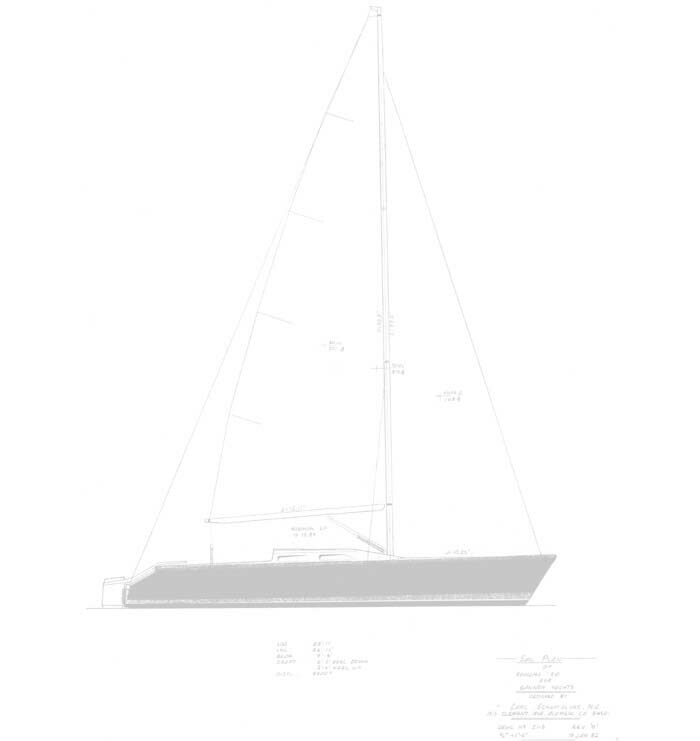 So, we bought a boat. We left her in LA for a few weeks, as the former owner had a few more projects to finish, including several coats of hard epoxy on the bottom and a touch-up of the teak. Then, one Thursday, we get a call: "Hey, kids, the boat's done, and I've nearly come to blows with the marina owner. The boat's gotta be out of the yard by Sunday!" Phone calls quickly ensued. We quickly found a temporary spot to park her. An email came in from an old (elementary school!) friend living in Australia: "I'm gonna be in LA for a couple of weeks. We should get together." Little did he know what he was in for. Knowing he's always up for an adventure, I bounced back immediately: "Hey, Todd! How about driving to SF, following a boat?" What a good sport, he agreed. 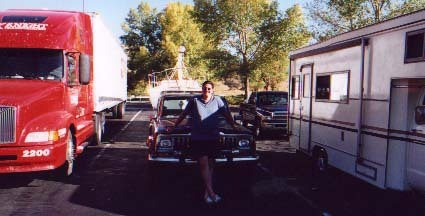 Bright and early one morning, I tore off to LA in my 20-year-old Full Size Jeep (the "Canyonero! ")- here goes nothin'! Took a full day to pack the boat and a rented pickup truck with all the Boat Crap the volume of which only fellow owners can really know. Then it was time to learn how to tow -- what better way to learn to tow a trailer - for the first time ever! - than with your brand new, 4000-pound boat behind a 1981 truck? There were a few challenges. Like discovering the trailer was wired wrong - the brakes went on FULL when the headlights were on, and the brake lights went on when I stepped on the brake... (and, YES, it was the trailer wiring, not my wiring of the new brake controller!) I bet there were a few people who wondered why I was flashing my lights at them as I tried to slow. And, of course, dragging a boat over the dreaded Grapevine. 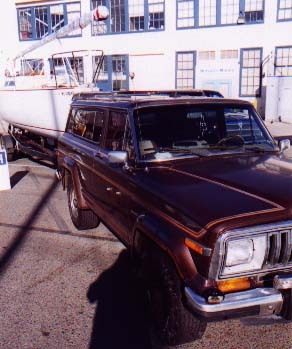 But, the Canyonero did great, and the boat did great, and I learned relatively quickly how to get down the highway. Didn't clip a single curb, during any of the MANY gas stops, I have to say!